Thematic maps are maps that display data using color shading and/or symbols. This thematic map shows data at a ZIP Code level. The circles represent households that respond to incentives, with darker circles representing areas more likely to respond. The green-shaded ZIP Codes in this thematic map show adults who shop at home electronics stores. Thematic maps are are used to help profile customers and in site selection. 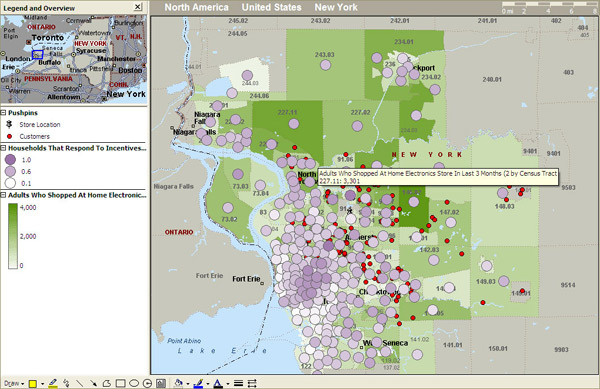 Mapping Analytics can create thematic maps for you. We also offer mapping software packages and data allowing you to create your own thematic maps.